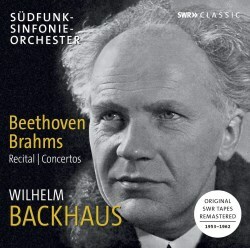 There is a wealth of Backhaus broadcasts to supplement his powerful recorded legacy. This is especially true of the 1950s Deccas which this SWR series, which charts the pianist over a decade between 1953 and 1962, largely replicates. The recital at Ludwigsburg in December 1953 presents one of his heavy-duty Beethovenian evenings where he programmed an early sonata with the Waldstein and ended with the Hammerklavier. He had recorded the Op.2 No.3 sonata in May the previous year and no one would expect a conceptual change from a pianist so experienced. In fact, you could probably take the two performances, one or two rubati apart, and other than recorded sound find it hard to tell them apart. The Waldstein is played with forceful drama and though it too largely resembles his July 1950 Decca recording it is noticeable that he takes a more agitated approach to the Rondo finale. That greater sense of intensity is also a feature of the Hammerklavier. His Geneva Hall recording of April 1952 is certainly not eclipsed – one or two finger slips suggest that Backhaus may have been tiring at this point in the recital – but he takes a more incisive, less horizontal approach to the Adagio sostenuto which is the one decisive difference from the more measured studio inscription. Indeed, he was to take a similarly more athletic approach in this movement in his Bonn performance of 1959, which can be found in an ICA release. For the Beethoven Emperor Concerto in 1962 he was accompanied by the Stuttgart Radio Symphony and Joseph Keilberth. If you know the May 1953 Vienna recording with Krauss and the live broadcasts from later in the decade such as the Cologne Radio traversal of 1956, you’ll find the Keilberth to be pretty standard. There are a few slips, instrumentally, but the conductor takes care to balance the winds so that important cues are always audible. It’s a forthright, laudable reading all-round. A few years earlier Backhaus took on another of his concerto warhorses, Brahms’ Second, this time with Hans Müller-Kray directing the Stuttgart orchestra. He’s typically unsentimental here, forthright and powerful. He has even tightened up his conception for the slow movement which may be a surprise if you only know his 78 set made with the Saxon State under Böhm in 1939. With a level-headed conductor like Müller-Kray on board - so often taken for granted as was, for example, Wilhelm Schüchter - the performance is predicated on the firmest of musical principles. The encores are three of Brahms’ Op.39 waltzes, played in rather a square-jawed kind of way. In addition to this and other discs mentioned, more examples of Backhaus’ Beethoven cycles can be found on Audite and Meloclassic, amongst others. This twofer may not shed any radical light on Backhaus during the period under discussion, but it could hardly be expected to. It succeeds in amplifying known strengths in fine sounding monos typical of SWR’s high standards.